Ryan Moore won the 1000 Guineas for a second successive year as Aidan O'Brien's favourite Minding triumphed over the Rowley Mile at Newmarket. It was a third victory in the coveted fillies race for trainer O'Brien, who took all three places, with Ballydoyle second and Alice Springs third. Moore, the Newmarket Guineas double winner last year, guided the 11-10 shot to victory by three and a half lengths. Ballydoyle (15-2) came from the rear of the field to finish a distant second. 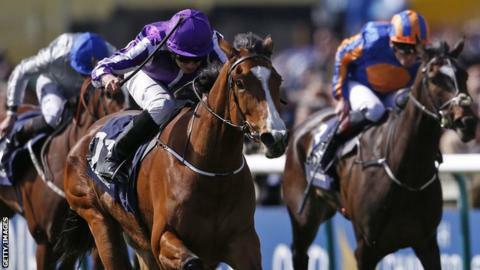 O'Brien admitted that next month's Oaks over a mile and four furlongs at Epsom, the second of the three classics for fillies, was under consideration for Minding. "We've always thought she'd stay but obviously we'll talk about the Oaks, as you would," O'Brien said. "She's something to look forward to." After Lumiere set the pace at Newmarket, Moore powered through the field on Minding and said: "We didn't go that quick early on but she hit the gates very well and I didn't want to be taking her back. "I was expecting a bit more speed in the race. She's just faster than them and stays better than them. She's faster than them all." Asked about the extra distance of the Oaks he said: "It (mile and a half) is another question, but she looks like she'll go further." It was O'Brien's 250th Group One success and Moore added: "His record is unbelievable, there's no one better to get a horse ready for a top race." "What a way to bounce back after Air Force Blue flopped in the 2000 Guineas the day before. "Though it was, of course, far too early to suggest that the O'Brien horses were out of form, after Saturday there was the odd muttering, silenced now by not just a winner of real authority but by a one-two-three for the stable. "All sorts of Epsom talk followed, but don't be surprised to see better there from second-placed Ballydoyle, who stormed home through the final furlong from last place."